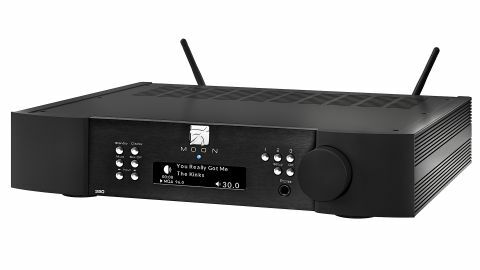 Moon 390 streaming preamplifier review | What Hi-Fi? Look at the history of hi-fi and you’ll find few components have had to adapt as much as the humble preamplifier. This control hub has become something of an electronic chameleon over the decades, remoulding itself on multiple occasions to match the changes in hi-fi fashion. In the early days of analogue, stereo preamps had to have a phono stage, multiple tape loops, tone controls and various filters to optimise vinyl replay, if they were to be taken seriously. As time went on and CD rose to prominence they became simplified line-level units and gained remote controls. Now, firmly into the age of network audio, we’re seeing an increasing number of products where streamer functionality is included, along with a range of facilities that move quality hi-fi firmly into the realm of multi-room and convenience. Moon’s new 390 is a terrific example of this breed. It’s packed with facilities. Alongside the network streaming it has embedded Tidal, Qobuz, Deezer and TuneIn radio, as well as including useful features such as a switchable MM/MC phono stage and headphone output. The Moon is Roon-ready too. Alongside all that is a terrific range of physical connectivity. Digitally it has USB, optical, coax and AES/EBU. Unusually, there’s also HDMI with four ins and a single output, so the 390 will integrate comfortably in an AV set-up. While its possible to connect to your home network wirelessly, we recommend sticking to the wired option if possible, for a more stable way of doing things. Analogue hasn’t been ignored. There are balanced XLR and single-ended line-level options for both input and output. That phono stage isn’t an afterthought either. It’s a configurable module, one that’s able to cope with a wide range of cartridges. Cartridge loading is adjusted through the Moon’s set-up menus where the gain, impedance and equalisation curve can all be fine-tuned. Considering just how much is packed into the box, the 390 presents a simple face to the world. Its low button count is possible thanks to most of the functions being easily accessible from Moon’s dedicated MiND app (free on iOS and Android). While a traditional remote is supplied along with the unit, this app is clearly the way to go in day-to-day use of the streaming functionality. The app isn’t perfect though. While easy enough to use, it falls short of the slickness and logic displayed by software from the likes of Naim. Still, apps are continuously being finessed, so we hope and fully expect Moon to improve things over time. Generally, the 390’s build is as good as we’ve come to expect from the brand. The product feels like a luxury item, and the controls, particularly the smooth-turning volume control are a pleasure to use. This Moon is available in three finishes – black, silver and the rather smart two-tone option of our review sample. We’re less happy with the OLED display though. It’s small, and depending on mode, can look cluttered. Rival designs often have full colour screens, which make the 390 look a little basic considering its premium price. Once again, the app comes to the rescue offering the user a clearer view as to what the unit is doing. It doesn’t take us long to get started. We plumb the Moon into our reference system, taking the place of our usual Gamut D3i preamp. Our sources are Naim’s NDS/555PS streamer combination and Rega’s excellent Planar 8/Apheta 2 record player alongside the embedded streaming services and network capability of the unit itself. We also try out the 390’s Bluetooth input using an Apple iPhone 6s Plus. For much of this test the Moon feeds our reference Gamut D200i power amp and ATC SCM50 speaker combination. We start by using it as an analogue preamp and it sounds superb. With the line level output of the Naim streamer (we haven’t forgotten the 390 has a streamer built in, we just needed a high quality line level signal) it delivers a lovely, fluid sound that brims with detail and expression. The overall presentation is exactly as we’ve come to expect from the brand. It’s refined and just a little on the rich side tonally. But, when we listen to a range of music from Trent Reznor’s Social Network OST to Jay Z’s Black album, this unit still delivers enough in the way of drive and rhythmic cohesion to keep us happy. The 390 paints dynamic sweeps with confidence and, despite an overlaying sense of smoothness, has enough bite to really kick-on with tracks such as Jay Z’s Moment Of Clarity. The story remains much the same when using the internal DAC. We connect our MacBook to the USB input and find that the Moon has no issue skipping from DSD (up to DSD256) and 24-bit/192kHz PCM (with a upper limit of 384kHz) to MQA files. Stravinsky’s The Rite Of Spring comes through with its savagery intact. There’s a fine sense of organisation and a commendable level of composure when the piece gets demanding. The 390 never sounds rushed or flustered, and that allows the listener to sit back and simply enjoy the music. The story is equally positive through the other digital inputs, though the likes of Bluetooth display the shortfall in outright transparency we’ve come to expect. Next we try the network streaming aspect, and here the Moon still manages to deliver a strong performance. It isn’t quite as expressive or driven as the very best streamers around but will give most below the two grand mark a hard time. There’s a good amount of detail and that ability to organise it into a musical whole stays intact. The additional convenience of built-in streaming services can’t be understated. Using Tidal, we enjoy Young Father Cocoa Sugar with its inventive arrangements and funky rhythms. Then we get lost in the atmospheric and affecting Re:member by Olafur Arnalds. Throughout it all the 390 works with a well-oiled slickness that’s deeply impressive. Yes, the app could be better, but Moon’s achievement shouldn’t be underestimated. It’s difficult for a relatively small, audio manufacturer to combine all these features into a product and still make it sound good enough to please purists. Yet, that’s exactly what it has managed. Back to traditional hi-fi ground, we play Orff's Carmina Burana using Rega’s Planar 8. The deck is fitted with an Apheta 2 moving coil cartridge and we take advantage of the 390’s configurable nature to fine-tune gain and impedance values. We’re impressed with the low noise levels and the pleasing sense of clarity, but here we feel a little too much of the recording’s sparkle is lost. The result is certainly listenable and enjoyable, but we know the record player is capable of better. We’re much more positive about the headphone output. Having tried it with both the Grado RS1s and the Beyerdynamic T1s, we’re happy to report that much of the good work we hear through the line outputs is preserved here. It’s clear that this output isn’t an afterthought, as it so often is in most products. The Moon 390 has much to commend it. As a neat way of combining a multitude of components in one neat box it has few rivals. It’s a terrific analogue preamp and a good streamer. The inclusion of Bluetooth is sensible – there are so many people with music stored on portable devices that it’s only right that Moon has tried to make the most of it. It’s possible to build a superb system around this product. Such a set-up would not only sound lovely but offers the kind of neat, uncluttered approach that’s rarely part of high-end hi-fi. For that, Moon deserves a big pat on the back.